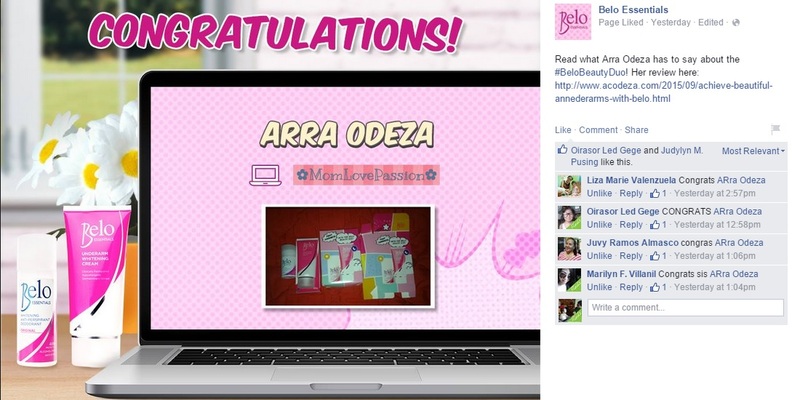 I was on my way to Manila yesterday when I read the good news that I'm one of the ‪#‎BeloBeautyDuo‬ winners from the Belo Essentials Facebook page. I was flooded with "Congrats" greetings and indeed an overwhelming feelings for me. The promo is about sharing Belo beautiful experience with Belo Essentials by writing short review of the Belo Beauty Deo and Belo Underarm Whitening Cream from August 28-September 11th. Winners were chosen from 600+ entries made from IG, Facebook and Web/Blog reviews. Luckily I am one of TEN (10) WINNERS of two (2) Revlite for Underarms Gift Certificates from the Belo Medical Group. Yey! Thank you very much to Belo Essentials group. More Power!